If 7-Eleven and Mitsuwa sired an offspring, that child would be Famima!! And contrary to what may seem like an overenthusiastic beginning to this post, the exclamation points -- both of them -- are part of the brand name concocted by FamilyMart, the Japanese company with over fourteen thousand such stores throughout the planet, including about a half dozen already in L.A. 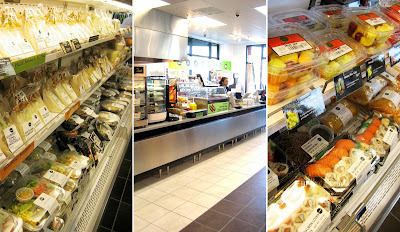 The first Orange County store opened in Fountain Valley last week, hawking onigiri and boxed sushi, "gourmet" sandwiches and curry bowls along with the Icee's (subtitled as Famima!! Freeze) and hot dogs rolling on a weiner treadmill. But besides that and other convenience store staples like chips, magazines and lottery tickets, Famima!! 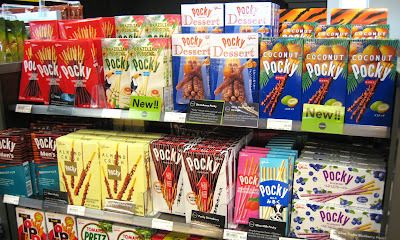 's main attraction just might be the wall of Pocky. They've got no less than ten varieties of the beguilingly popular, chocolate-dipped Japanese bread sticks. There's a Pocky for every mood; even Pocky Men's, for those too masculine and macho to eat just regular ol' Pocky. If Famima!! seems a bit incongruous to what you think a typical convenience store is like, it's because the company's aim is to attract more women and affluent customers, less winos and truck drivers. But to me, a convenience store is a convenience store. 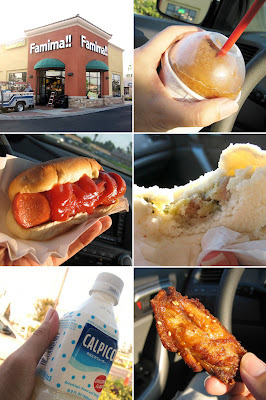 So we skipped all the frou-frou stuff and grabbed a few quick items to eat where most people would eat convenience store foods: in the car. "The Steamy Pork Buns" ($1.50) we bought had already turned into a soggy mush when we bit into it and the hot dog was just a hot dog (2 for $2.49), but the sesame wings (5 pieces for $2.99) were surprisingly crisp and flavorful, tasting very much like a less greasy version of Yoshinoya's sesame wings. We washed it down with cola Icee and swigs of Calpico*, a non-carbonated Japanese soft drink that tastes like milk mixed with Squirt (it's actually a lot better than it sounds). The verdict is still out on how well Famima!! will do here, especially with a Del Taco that still does "3 Tacos for $0.99" on Tuesday nights, a no-name liquor store, and now a newly opened Fresh & Easy across the street. After all, a convenience store is only convenient to those living within a mile of it. And it remains to be seen whether the neighborhood will be receptive to a gussied-up ampm that sells tofu salad at all hours. Maybe a more apt title would be "Famima??" *We won the drinks as a prize from the give-away game they've set up outside the store during the grand opening. LOL I though that place was going to be a Mexican Restaurant. Darn! Thanks elmo for the heads up about this place it seems interesting. I love calpico to death, having first tried it at Tsuruhashi but I would liken the flavor more to melted Pinkberry frozen yogurt, again tasting a lot better than that description sounds. Great write up of King Lobster Place for the OC Weekly. I want to go now. Its close to me and will save me a trip to Little Saigon! How did you get a picture behind the scenes in the kitchen? Do those people know you are going to write a review on them? I would love to have seen more pictures of the actual food there! I'm glad you enjoyed this joint. I actually work right across the street. This has been the tutor's place to pig out during break time, even though Fresh & Easy opened right next door. I was telling my wife about it(who is Japanese and from Japan) and she was excited. After she got off of work we went there(it is now 2:19AM and we just got back from there). Finding out that it's 24 hours was awesome! and Sampled the Chicken Wings and Corn dogs. I'm glad to have read this, I think we found a new late night spot. Well, if it's any consolation, Famima!! does have Doritos! HAHA! Believe or not, this was my first taste of Calpico. Now I'm hooked. I've known about it for years, under its notoriously funny original brand name, Calpis. Now I wonder where I can buy this stuff in bulk. Costco has yet to carry it! Ask an ye shall receive. Herewith are the pictures I took at King Lobster Place. The one they used for The Weekly I requested that the photog snap. So I didn't go back into the kitchen (though that would've been awesome). But that would compromise my anonymity -- no restaurant knows if/when I'm going to write about them...and that's how I likes it! My only wish is that there's one across the street from me! Wow! Thanks for posting! This blog and Famima!! actually does have a practical purpose. I'm also going to keep this in my pocket for late night munchies. I was excited that Famima!! was opening and went there Saturday morning about 7:30. I got the steamed pork bun as well, and an Iced coffee. The bun was horrible. One bite and tossed it. Soggy and absolutely flavorless. The coffee was good though. I was disappointed that the store was so americanized and that the prices were very high. A cold noodle dish, very small, was $6!! and selection was so so. Followed Famima!! with a trip to Fresh and Easy across the street. Much more impressive. I like to see more of those markets down south! Hey Elmo - Would be nice to have a few of those down here....some wings and Pocari Sweat = lunch of champions. The selection of packaged ready-to-eat and heat-and-eat stuff was ample, and enticing. I chose the colorful Five Cheese Tortellini with Roasted Red Pepper Sauce...but it was a big disappointment when consumed the next day. There was something nasty about either the sauce or the cheese shavings on top (or both). I know you said that they don't want to attract winos, but any idea if they sell beer on the cheap like a normal convenience store would? More specifically Japanese beer? Yup. Same situation with my steamed bun. I think it was probably edible at some point, but storing a bun in that steam box indefinitely is just a bad idea...unless it's their intention to serve what amounts to a sopping wet mess. If things go well in OC, I think the migration will march South sooner than you think! I heard they are planning another one in OC somewhere (Huntington Beach, IIRC). Famima$$ Well done! Well done! I wish I thought of that! You're right about the "gourmet" offerings, they look ridiculous during daylight hours, but might look attractive after midnight, sort of like the whole city of Las Vegas! Since I made a beeline towards the food, I completely missed its beer and liquor selection or prices. I also neglected to check if Thunderbird, MD 20/20, Night Train, and Wild Irish Rose were available. But if they were, I'm sure a nice inconspicuous paper bag would be provided, free of charge! I love that bit! "Pleez do not yell in da casino." I think Famima *click* *click* would catch on right quick! I like Men's Pocky(I know that sounds dirty) because I prefer dark chocolate. I think that kind of place sounds like a great idea. I would go there over 7-11 any day. Sorry I haven't commented in awhile. Things have been crazy trying to get William therapy for his autism. I have been neglecting blogs. Nah, don't worry. Blogs are just a trifle...a diversion from the important things in life. If I didn't have to write it, I probably wouldn't have anytime to read my blog either! I've also been guilty of neglecting my favorite blogs. BTW, my subscription to your blog expired. i've been a secret fan of your blog for a while, but had to comment b/c i had been wondering about Famima. The name (and punctuation) was perplexing and i would not have known at all that it was a Japanese food mart. your blog has introduced me to great places and i almost always agree with your assessment. thanks! Geez Elmo, ketchup on a hot dog? I find it hard to believe a 10-year-old could produce this blog, so I'll chalk it up to your ironic sense of humor. That's the only reason you should smother your hot dog like that! You're right about saying how a convenience store is only convenient for those living closeby. I made the trek from Tustin the other day and might as well have gone to Mitsuwa, which is a little closer, with lower prices on a lot of the same kind of stuff. I'll wait until a closer one pops up. P.S. What the...?! I love my dogs with ketchup! I didn't know that was bad hot dog etiquette (haha, 'hot dog' and 'etiquette' shouldn't be in the same sentence). Thanks for the nice note! I like that you said you "almost always agree" with my assessment. That's all I can ask and all that I hope! HAHA! Well, I knew someone was going to say something about the ketchup...and I'm glad it was you! It was actually my lovely dining companion who applied the condiment since she got the hot dog. Although I'm not completely against ketchup on weiners, my choice would've been mustard. Plain yellow mustard. Maybe some relish. But definitely, lots of onions! Too true on both points, especially on "hot dog etiquette"! Also, I wouldn't go out of my way to go to Famima!! either. Though if I lived within a mile of it, I might frequent it more than what's probably good for my wallet. The place is damned expensive...but when you think about it, so is 7-Eleven. I gotta give props for the find. I'm a night shift worker and the selection for food available on a weekday night is already sparse without looking for something even remotely healthy. I went today and got some sushi and caved in and also got the sesame wings. They gave me 4 for 2.99, not 5. I really do like how they have nutrition labels on all their premade foods and also have some brown rice alternatives. I'm definitely planning to go back, cooking with a toaster oven and microwave 5 nights in the office is just too monotonous. FYI I went to Famima this morning (7/29) and bought a steamed pork bun, not soggy, very tasty, unlike the drippy curry bun I bought last week. So I think they are working out the tweaks. So there it is! The reason for Famima!! 's existence and the secret of its future success, night-shifters! I'd be there in a heartbeat too if my only options were the microwave! Thanks for the briefing. Well that's good to hear. I thought the sogginess was due to the fact that it had been steaming there, in that case, for hours. So it sounds like they found a way to avoid that now. Calpis Water?!? I'm on my way now. If they have Super Lemon, I may have to move in. Aw. Forgot to check for that flavor. But if they have every Pocky imaginable, they need to have every Calpis too! I went to King Lobster Palace the other night and you were totally right about the lobster. Glorious! We saw the first Famina being built in downtown LA, then the second, then the third. Wow, they're in OC now? We've only stopped in once to look around (LA store) and it looks pretty full, especially with a hungry lunch crowd. Don't know what to think of them yet, but I do agree, a convenience store is a convenience store. Thanks for the heads up, time to shuffle on down there for a look! I know right!!! I'm dreaming of that lobster as I type this. And I've never liked lobster, but I loved King Lobster's lobster. If they had one within walking distance from my work or my home, I'd be more excited...and poorer, not to mention fatter. "If Famima!! seems a bit incongruous to what you think a typical convenience store is like, it's because the company's aim is to attract more women and affluent customers, less winos and truck drivers." Well actually, that is how every convenience store is like in Japan ( the attract women part) they even sell feminine hygiene and beauty products. They are just trying to apply the Japanese convenience store recipe in the US. Except that Famima!! is more expensive than the Japanese FamilyMart. As for the convenience, convenience stores are ubiquitous in Japan in urban and semi-urban areas, even in residential areas, so most people have a convenience store near their home or condo. Japanese people use cars a lot less, you won't find suburbs so big you have to take the car to go shopping. You can perfectly live without a car there, unless you live in the sticks. The configuration of American cities and towns makes the proliferation of such stores arduous unfortunately, except for densely populated areas. I've been to other Famima locations before we visited this one and I was really disappointed by the FV location. Their hot food selection (or lack there of) was not impressive and again, their steamed bun was soggy and un-appetizing. The Famima that was the most memorable was the location in Culver City. They had everything from hot soups to toasted ravioli (the taste/quality you would find in an Olive Garden). It truly was convinient and you could have a great filing meal there. I love Famima, We need more in the OC!! This Famima closed early this year. A 7-Eleven is going to open in its place in late 2010/early 2011.